While the Orion Nebula is one of the closest stellar nurseries to Earth and that makes for great viewing in backyard telescopes, it is not the most prolific star-forming region in our galaxy. 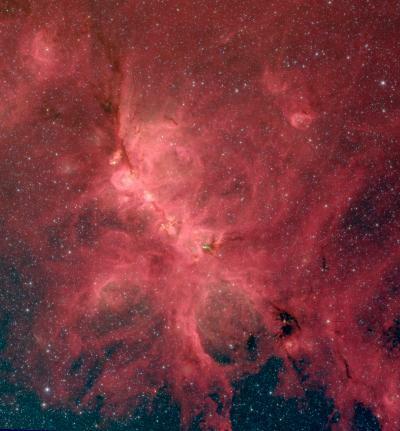 That distinction may go to the Cat's Paw Nebula, otherwise known as NGC 6334, formally known as NGC 6334, which is experiencing a "baby boom." contains about 200,000 suns' worth of material that is coalescing to form new stars, some with up to 30 to 40 times as much mass as our Sun. It houses tens of thousands of recently formed stars, more than 2,000 of which are extremely young and still trapped inside their dusty cocoons. Most of these stars are forming in clusters where the stars are spaced up to a thousand times closer than the stars in the Sun's neighborhood. The cause of the baby boom in NGC 6334 isn't clear. Two processes often suggested to trigger bursts of star formation are blast waves from a nearby supernova explosion, or molecular cloud collisions when galaxies smash together. Neither is the case here. In the future, NGC 6334 will resemble multiple Pleiades star clusters, each filled with up to several thousand stars. Unfortunately, it won't look as impressive as the Pleiades to Earthbound telescopes because it is more than ten times farther away, at a distance of 5,500 light-years, and its location in the galactic plane obscures the region behind a lot of dust. 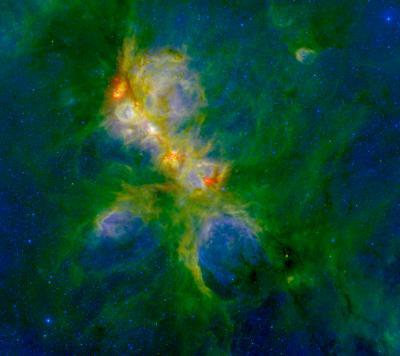 "NGC 6334 is forming stars at a more rapid pace than Orion - so rapidly that it appears to be undergoing what might be called a burst of star formation," said lead author Sarah Willis of the Harvard-Smithsonian Center for Astrophysics (CfA) and Iowa State University. "It might resemble a 'mini-starburst,' similar to a scaled-down version of the spectacular bursts sometimes seen in other galaxies." "Young galaxies in the early universe are small smudges of light in our telescopes, and we can only study the collective processes over the whole galaxy. Here in NGC 6334, we can count the individual stars," explained co-author Howard Smith of the CfA. The region was observed with the Spitzer Space Telescope and the Blanco telescope at the Cerro-Tololo Inter-American Observatory. "Both space and groundbased observations were needed to identify the young stars," said Lori Allen (National Optical Astronomy Observatory), the principle investigator of the observations. The starburst in NGC 6334 began relatively recently and will last for only a few million years - a blink of the eye on cosmic timescales. "We're lucky, not only because it's nearby but also because we're catching it while the starburst is happening," said Willis.